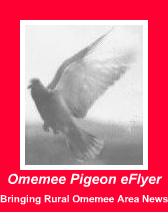 Omemee Pigeon eFlyer: Omemee Women Helping Haiti! All Omemee area women are invited to come help put help put together hospital care kits and birthing kits for the women of Haiti. Another very important ongoing project is the crocheting of sleeping mats from milk bags. The next get together is Tuesday, April 5th at 9:30 a.m. If you cannot attend donations of items and plastic milk bags are always welcome. Donations for this important program can be dropped off at the Second Chances Boutique, or Reaboro-Omemee Baptist Church,21 Sturgeon St. North, Omemee, Ontario. Interested in creating a milk bag mat yourself? It's so easy even kids can help!